Ronan Curtis is attracting interest from Championship and Scottish Premiership clubs, according to Leroy McCourt. Speaking to the Derry Journal, McCourt – who coached the Pompey winger as a junior – revealed a Premier League-chasing outfit phoned him up asking for his verdict on the Republic of Ireland international. 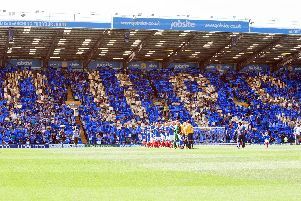 Curtis has enjoyed a scintillating maiden season at Fratton Park. Since moving to the Blues from Derry City last summer, the 23-year-old has scored 12 goals and created 15 during Kenny Jackett’s side’s League One promotion push and Checkatrade Trophy triumph. His rampant form has also earned him a breakthrough to the Eire senior set-up, while he was awarded his country’s Under-21s Player of the Year last month. McCourt worked with Curtis when he was a youngster at Foyle Harps. The south London-born talent’s ex-coach compared him fellow Derry aces Shane Duffy and James McClean – at Brighton and Stoke, respectively. And McCourt, who works as a full-time scout for Brighton in Ireland, told that a Championship side in the play-offs have been in contact to discuss Curtis’ attributes. He said: ‘Ronan is absolutely flying. ‘He’s actually taken me by surprise as well. He has to be the best newcomer in League One and I know for a fact there are Championship teams looking at him and Scottish Premier League clubs. ‘There’s a team high up in the play-off places of the Championship who rang me looking for my advice about him and I gave him a glowing tribute. ‘He’s a strong will and he’s a good lad. ‘He’s like Shane and James McClean. They have this endless energy and don’t seem to tire. ‘When it came to technical ability those boys were maybe 7/10 but when it came to determination they were 11/10. ‘James is the exact same. They just have that heart to win and great genetics to be fair. Curtis was the subject of online reports suggesting 30 Premier League and Championship clubs had sent scouts to watch him earlier in the season. Boss Kenny Jackett insisted Pompey received no bids or enquiries.